Nancy’s master classes are on demand internationally at universities, film schools, and actors centers. In addition to teaching on-camera technique, she also organizes worshops, symposiums and panel discussions at film festivals. Actors are increasingly asked to tape their own auditions and send them in to casting directors. Actors who master the skills of self-audition have a crucial advantage in booking the role. In the workshop, participants will be assigned material in advance, prepare a self-taped casting and bring it to class on a flash drive. On the day, Nancy will give a critique of the material. This session will be followed by cold reading exercises that drill auditioning actors and Nancy will teach strategies for approaching scene work. 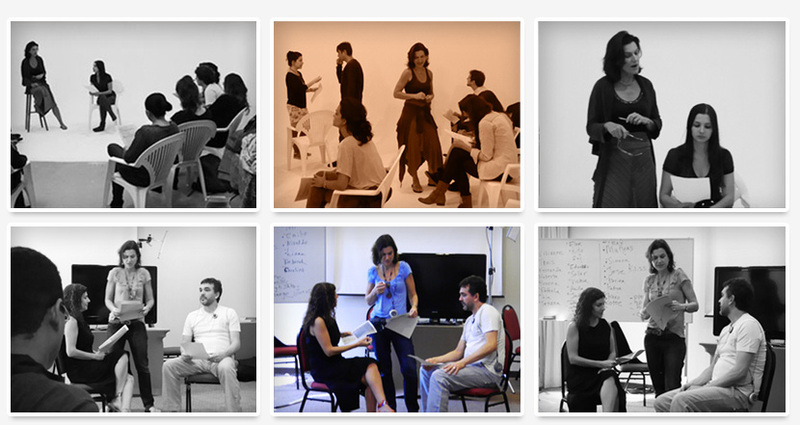 The class will start with a series of exercises that develop effective methods for on camera acting work. Areas covered will include developing an inner monologue, the reaction shot, and cold reading. Actors will have an opportunity to perform a short scene from an actual film, which will function like a mock casting. Everyone will receive one-on-one coaching with Nancy. This master class is designed for professional actors who wish to improve their film acting skills, develop their casting technique, and plan strategies for promotion on the international market. During this five day intensive course, students will develop professional quality material in English to add to a show reel. This seminar and demonstration underscores the main points of film casting technique. Actors will watch and critique actual film castings of successful actors and discuss their success strategies. How to choose a winning headshot. How to organize a successful website. How to produce an effective show reel. How to make an effective self casting. How to best take advantage of the Internet for actor marketing. Actors can bring their own reels and material for critique. Actors participate in a series of exercises that develop effective on-camera methods. Material covered will include aiming for a strong objective, close-up vs. wide shot techniques, playing an inner monologue and playing in the eyes. At the end of class, actors will be assigned two scenes from actual film scripts in English to prepare for mock castings the next day. Actors will apply the techniques they learned on Day Two to perform two casting sessions in front of camera, followed by a critique. The scenes, chosen from actual film scripts from projects that Nancy has cast, will include a variety of genres ranging from historical drama, to action/thriller to sci-fi. Each participant will get one-on-one coaching in front of the camera with Nancy. Actors will continue to work on exercises that develop a natural on-screen presence. Actors will choose one scene that they wish to develop for filming on the final day. It can be a scene from the day before or a scene of their choosing. The chosen scene will be taped and subject to constructive critique by the class. Day 5 will take place in a studio where a professional camera operator will light and shoot scenes for every actor. Each actor will provide a mini-tape and will be able to take away a scene in English that can be edited onto a show reel. This will be followed by the final party! Don’t blame your agent if you’re not getting work. This two-hour seminar focuses on strategies for actors to promote themselves in an increasingly competitive market. The Internet is the great democratizer, offering endless possibilities for actors to get themselves seen. Nancy is committed to actor training. Nancy first started teaching film acting and audition technique when she noticed that many experienced actors auditioned poorly, due to underdeveloped on-camera skills. With this in mind, Nancy created a series of techniques, also outlined in her book Auditioning for Film and TV. In 2009 she founded the Acting Program at the Prague Film School, which offers semester long and full year conservatory training. Nancy is also sometimes available for private and on-set coaching.